I am astonished to discover that I never wrote about Bo at Ballard Creek, one of my favorite books of 2013. That book is about the realistic (and yet fantastic) adventures of Bo, a four-year-old girl, who was adopted as a tiny baby and raised in a mining camp by two best-friend miners, Arvid and Jack, in the 1920s. After reading all about her wonderful town full of people that love her, I was sad to reach the end–particularly as the book ended with her little family (recently increased by the addition of another orphan in need) having to leave Ballard Creek after the mine is played out. 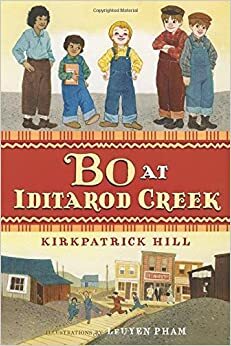 I never expected to see a sequel, but I was thrilled when I found out that Kirkpatrick Hill had continued to chronicle Bo’s adventures in her new mining town: Iditarod Creek. Bo’s new town is very different from Ballard Creek — it’s bigger, uglier, and MUCH louder, and there are almost no other children aside from Bo and her younger brother Graf. She misses the trees and the tundra of Ballard Creek, but most of all she misses all of her friends — the Eskimos that lived in the village along with the miners. (Hill makes it clear in an author’s note that ‘Eskimo’ is the self-preferred name of the particular group of native Alaskans that she’s writing about). Bo never stays down for long, though, and makes friends with almost all the residents of her new town, young and old, male and female, Athabascan, Finnish, Inuit, Japanese, and white. Throughout the year she has her usual myriad adventures–making hundreds of donuts, catching guppies, going to the miner’s Fourth of July celebration, and even (gasp) learning to read! Bo’s sweetness of spirit is utterly charming, and this book would make a wonderful read-aloud for children too young to read a 200-plus-paged novel on their own, or any child who loved the Little House books. (A caveat for parents, though: the miners do occasionally say ‘Damn’, and in one chapter there is a conversation about hurtful names for people of other races). This book also ends with Bo and her family on their way to a new living situation–I can only hope that Kirkpatrick Hill continues this delightful series. A boy, a girl, a Viking babysitter, and a vicious (but still kinda cute) merbaby – To Catch a Mermaid has it all! When Halvor (aforementioned Viking babysitter) sends young Boom Broom down to the docks to pick up fresh fish for dinner, Boom finds himself with only enough money to choose from the reject seafood bucket. What he brings home turns out to be a growling, sharp-toothed merbaby. Naturally, Boom’s sister falls in love with the merbaby and they decide to keep her instead of returning her to the sea. Danger, hilarity, and fantastical adventures ensue! To Catch a Mermaid is a favorite of mine, by the hilarious and imaginative author Suzanne Selfors (click here to read a review of her book Fortune’s Magic Farm). This is a great read for kids 8 and up (or even younger as a read-aloud or for a strong reader). It seems like every year at this time, I assert once again that winter is the best time for slightly creepy stories — it’s cold outside, and we all like to huddle by the fire (or the radiator), feeling cozy and protected. A spooky mystery can add to that feeling of coziness — weird things are happening out THERE, but in HERE I’m nice and warm. 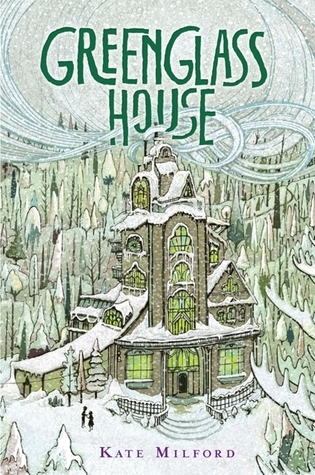 Greenglass House takes place right before a freezing cold, snowy Christmas. Milo is happy to have his loving innkeeper parents to himself for once, and planning to laze about over the school break. Unexpectedly, and at a time of year when this NEVER happens, the inn fills up with guests. And not just any guests: shifty guests. Shady guests. Guests who seem to be hiding something (or who are just plain unpleasant). It’s an open secret that Milo’s parents’ inn is friendly to smugglers, but do the guests know that? Is that why they’re there at such an odd time? Can anyone be trusted? And that’s before the mysterious thefts start, or the electricity fails due to sabotage Not to mention the ice storm! Milo’s parents and the cook are run off their feet, and Milo is either ignored or needed to help out. So much for Christmas! Luckily for Milo, the cook’s younger daughter, Meddy, hitched a ride with her mom, so he has someone to talk to. She introduces him to the role-playing game Odd Trails, one that his father used to play when he was Milo’s age. Milo’s game character is braver (and tricksier!) than Milo himself, and their games are a great cover for an investigation into the thefts and sabotage. Do the guests have anything to do with the most famous historical owner of the house? What do they really want? And what significance is there in the guest that arrives on Christmas Eve itself? Greenglass House is one of the best books I’ve read all year—it was enthralling, amusing, and emotionally affecting, with stellar, atmospheric prose. I’ve been able to recommend it to both adults and children, and everyone who has read it has loved it. 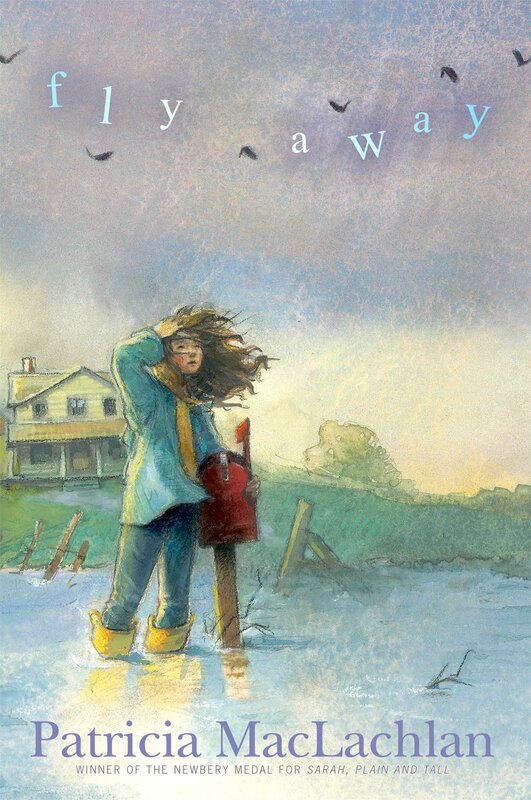 If you love Greenglass House as much as I did, check out any of Kate Milford’s other books. None of them are as cold and wintery, but we have them all here at the library, and they’re all truly wonderful. Lucy can’t sing. She wishes she could, but she just can’t seem to carry a tune. Her sister Gracie has a lovely voice. Even her brother Teddy who is not quite 2 and who hardly even talks, can sing perfectly in tune. However, only Lucy really knows that Teddy can sing at all. It’s their secret until a family crisis brings his talents to light. Every year Lucy and her family pack up their van, chickens and all, and go to help her mom’s aunt Frankie in North Dakota during the rainy season when the river floods. This year the raging river looks particularly fierce to young Lucy. When little Teddy goes missing one afternoon it is up to Lucy to overcome her fear of not only the river, but also singing, in order to find him. In Fly Away Patricia MacLachlan has captured the essence of the child’s point of view beautifully. Told from Lucy’s perspective, the family trip to Aunt Frankie’s takes on a childlike wonder. While the flooding river and the storms that cause it are certainly precarious, Lucy’s perspective adds a level of intensity that is specific to her youth. In addition, something as simple as her inability to sing carries extra feeling because we are experiencing the emotions through Lucy’s filter. Fly Away is a short, but moving story about what it means to be part of a family and accepting the talents we have been given instead of lamenting those we have not. It would make a good choice for fans of Arnold Lobel’s Frog and Toad books or Tomie DePaola’s memoir series. Readers who enjoy Fly Away should also try MacLachlan’s White Fur Flying as well. As someone who bears almost no resemblance to any members of my (awesome) family, I am fascinated by siblings who look alike, and by people who ‘look’ Irish or German or like they come from some other country. I’ve always wanted to find out that I look like someone. Ruth Quayle isn’t really expecting to find out that she looks like anyone — she just using FaceTrace, an Internet bot that searches for pictures that match her own. What she doesn’t expect to find are several pictures of someone who looks exactly like her, but ISN’T her. 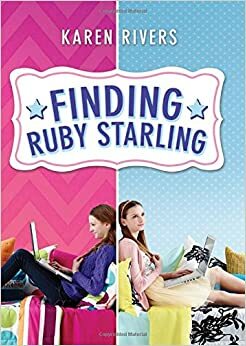 The mystery girl is Ruby Starling, who lives in England, and, since Ruth is adopted, just might be Ruth’s identical twin sister. Ruby isn’t sure who this crazy person sending her emails is, and her mother has DEFINITELY never mentioned that she gave away one of her babies. But her artist mother is kind of flighty . . . and Ruby’s birth DID take place in America . . . and maybe Ruby and Ruth really ARE identical twins! Finding Ruby Starling is one of the most engaging, heart-warming — and HILARIOUS — books that I’ve read all year. Written entirely in the form of emails, letters and Tumblr posts, the book perfectly delineates the two girls’ separate lives, and shows how similar — and how different — they are. Ruth’s best friend Jedgar, with whom she makes YouTube horror movies, is contrasted with Ruby’s older, fashionable friend Fiona. Ruth’s zany-yet-loving parents (a paleontologist and a heart-surgeon) are contrasted with Ruby’s artist/sculptor mother, and her recently deceased, very English Nan. Very few books can make you laugh uproariously while still touching your heart, but this book succeeds perfectly. It is, as Ruth would say, Totes Amazeballs! No one would ever call Donovan Curtis a gifted student. In fact, even average might be considered a generous label for Donovan’s academic abilities. However, when a seemingly harmless prank goes horribly wrong and there is a mix-up with some paperwork in the Superintendent’s office, Donovan Curtis finds himself on a very prestigious list of students who are being transferred to the Academy of Scholastic Distinction. Not wanting to ruin a good thing (or face the consequences of his actions), Donovan does his best to skate by under the radar in his new school for as long as possible, but being ungifted in a class of geniuses is not easy to hide. As his teachers and fellow classmates grow more and more suspicious, Donovan must work harder to become an indispensible member of the robotics team and his class in general or face being found out as an impostor or worse. Along the way, Donovan’s new classmates, teachers, and even his family come to realize that people are gifted in a variety of ways, and sometimes it can be the least likely addition that can make all the difference. Donovan may not be book smart, but he knows plenty about being average, and average may be exactly what the students at the Academy really need. Told from multiple points of view, Ungifted is more than just the story of Donovan trying to keep his head above water at the Academy of Scholastic Distinction. Unlikely friendships are formed, fences are mended, and stereotypes are smashed in this clever, funny and often heart-warming story of friendship and acceptance. Gordon Korman does a wonderful job giving each narrator a distinct voice. Donovan and his classmates are the stars of the story, but even among those stars, super-genius Noah Youkilis is a stand-out with his quirky fashion sense, obsession for trying to get kicked out of the Academy, and a newly ignited passion for wrestling. This is a fun, fast-paced read for middle school students looking for realistic fiction along the lines of Wonder without the heavy subject matter. Candice’s outlook may be generally positive, but this doesn’t mean her world is an easy one–her baby sister died of SIDS; her mother has had a double masectomy and is (understandably) suffering from depression; her father had a business blow-up with Rich Uncle Brian before Candice was born, and has been frustrated in his job ever since. More than anything else, Candice wants to fix her family. She knows it won’t be easy, but she has to try. And when Douglas Benson confides that he believes that he is from another dimension and needs to get back to his real family, Candice is skeptical, but can’t quite bring herself to NOT believe him. Candice is one of the most endearing, engrossing characters that I’ve read about in a long time. From her hilarious interactions with her teachers (regular and substitute) to her philosophical worries about her pet fish (does the fish think of her as a deity? Is it ethical for her to allow the fish to think so? ), to her heartfelt attempts to heal her family’s wounds, every moment in this lovely novel was affecting. The book comes to a satisfying conclusion, so there’s no reason for the author to write a sequel, but I wouldn’t be at all upset to spend more time with Candice.